When I first heard that Liberal Party (LP) bet Manuel “Mar” Araneta Roxas II spent ₱ 257 million just for August 2015 TV ads, my initial reaction was “meh, mayaman naman talaga si Mar.”. I know that he belongs to the wealthy oligarchy, so I guess that was expected. If my clan owns the Araneta Center, I guess I can afford to do that. 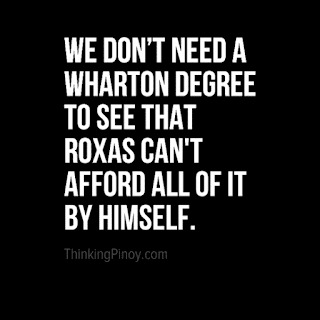 After all, how many Filipinos can afford to go to Wharton? 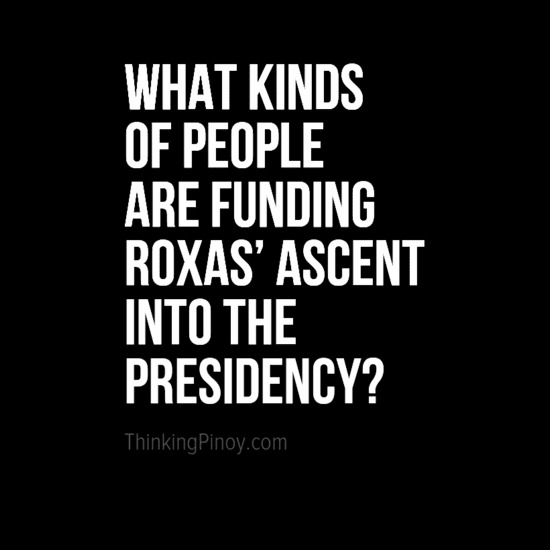 That’s why I was inclined to believe Roxas’ allies when they said he “uses his own funds”. 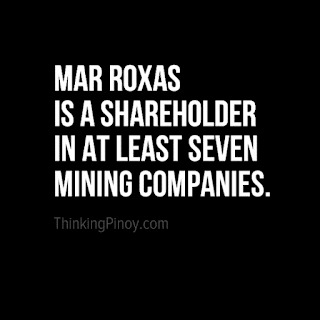 At this rate, Roxas should’ve already been disqualified, as any elementary school student will agree that 774 is a lot more than 545. 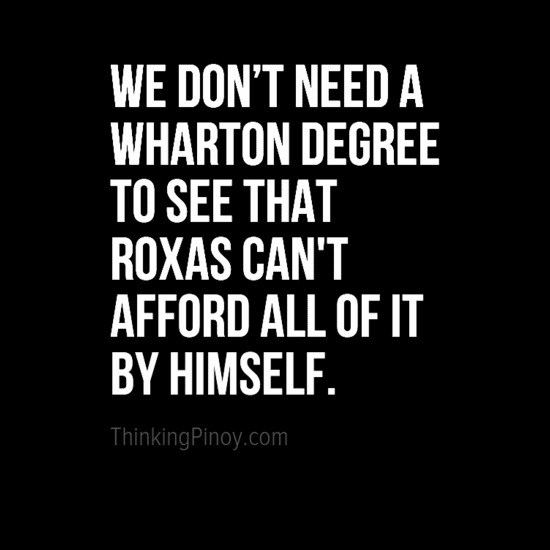 We don’t need a Wharton degree to figure that out. Bondoc of the Philippine Star reported Friday that private Cessna planes Roxas uses for his campaign sorties are wrapped in various anomalies. The aircraft are registered under Air Juan Aviation Inc., owned by a certain Francis Eric Gutierrez. 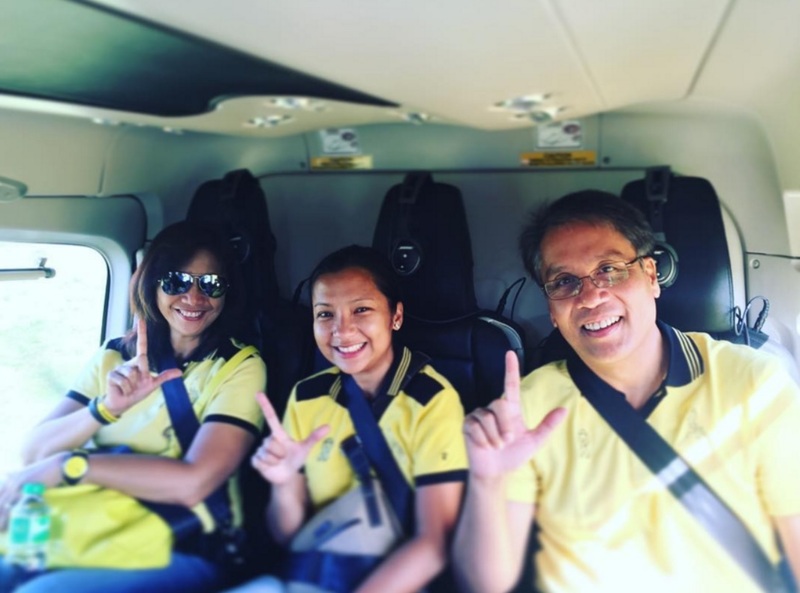 These planes are also used to fly VP candidate Leni Robredo and the Liberal Party (LP) senatorial lineup. 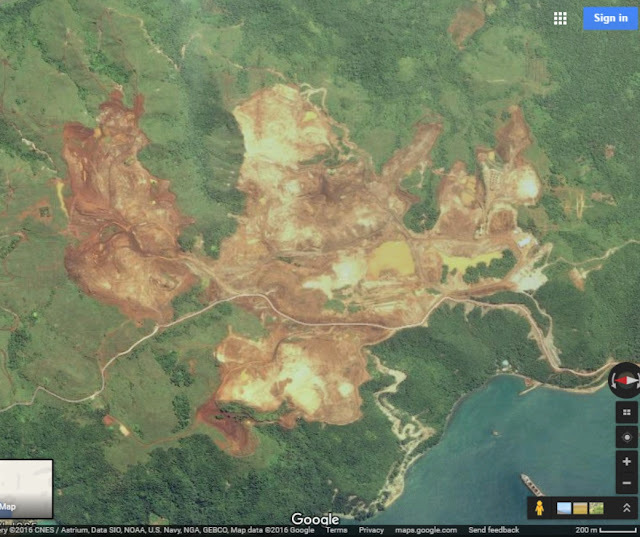 Small scale mining is supposed to rely mainly on manual labor, but SRMI's Tubay Mine appears to rely on heavy equipment and facilities commonly found in large-scale mining operations. 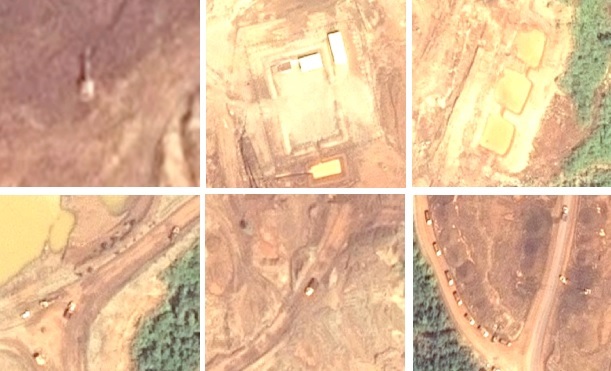 Clockwise from Top-left: an excavator; an office building or a processing facility;three tailings ponds; a convoy of dump trucks; another dump truck; yet another pair of dump trucks. 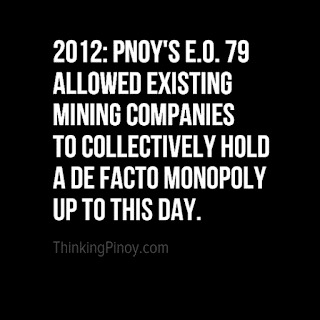 For example, MGB reported that for the year 2014, SRMI paid ₱45.3 million in royalties to Tubay’s Lumads, representing 1% of SRMI’s total mining review for that fiscal year. That is, SRMI 2014 revenues from their Tubay site were at ₱4.53 billion. The 2014 market rate was US$ 41 per ton. 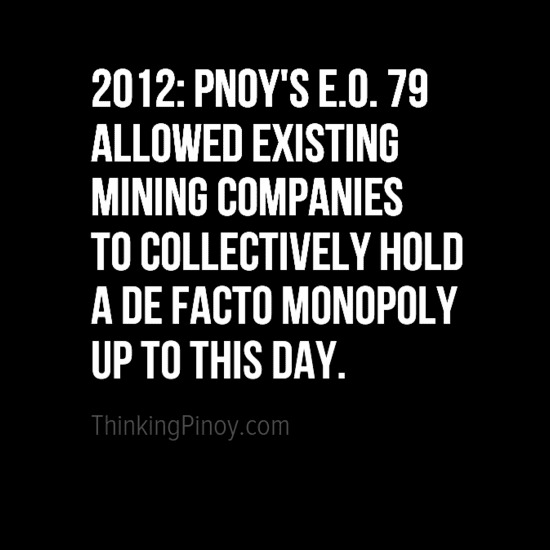 Using the Jan 2 2014 USD:PHP exchange rate of 1:44.49, ₱ 4.53 billion translates to about 2.48 million tons of ore mined in 2014. Former Cabinet Sec. 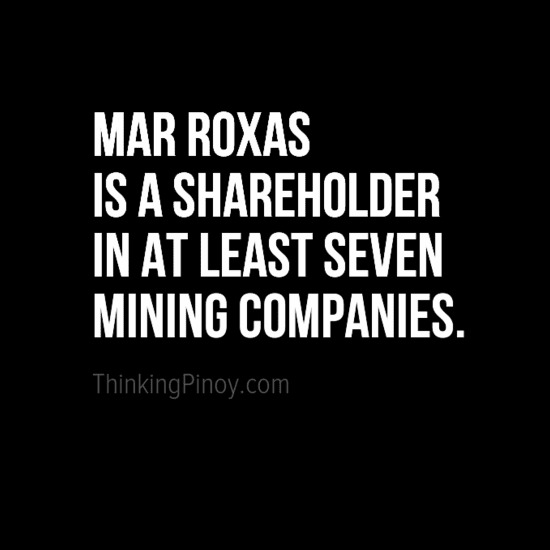 Ricky Carandang, now reportedly working for Air Juan, a Gutierrez-owned company. As pointed out by one of my readers, Bayan Muna's Rep. Zarate of the Makabayan Bloc is not administration stalwart. Zarate is one of the solons who had raised banners of protest inside the House during the SONA. 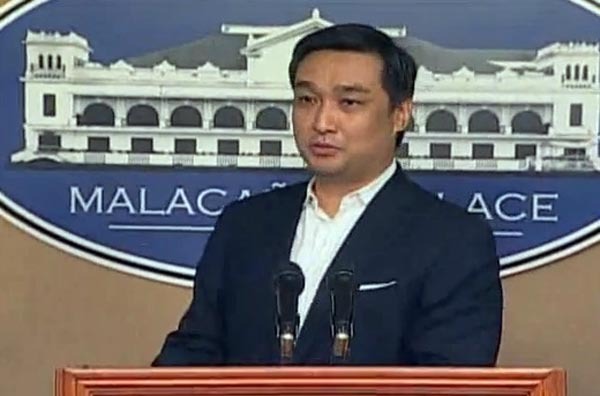 Zarate was also one of the first to ask for Roxas's resignation from the DILG, and said it was a matter of delicadeza especially as there was speculation on where he is getting campaign funds. Article content has been corrected to reflect this clarification.